This list of Pilgrimage Site are the Verso Ministries Top Pilgrimage Sites in Region 9. The Regions that will be used for all of our lists are based off of the Regions used by the National Federation for Catholic Youth Ministry (NFCYM) and used for the Bishop Conferences. These resources are here for Youth Groups, Young Adults, and Individuals to be able to find local sites to go on Pilgrimage to. The Grotto of the Redemption finds itself in the midst of a beautiful story of its founding. The man who had the idea, Father Paul Dobberstein, is said to have suffered from pneumonia in seminary and in the face of probable death he prayed for the intercession of the Blessed Mother, promising to make her a Shrine if he survived the illness. He made a full recovery and when he became pastor of the parish in West Bend, Iowa, began to collect rocks and many precious stones in order to eventually construct the Shrine. Today the Shrine is composed of nine connected grottos with different moments of Christ’s life portrayed within. It is also famous for being the largest man made grotto in the world as well as having the largest collection of precious stones in any one location. I strongly encourage anybody who is near West Bend to make a pilgrimage to this Grotto as it is truly one of the most beautiful works of human hands that has ever been made for the glory of God. The beauty of the Grotto can only point us to the greater beauty that is God and in this way we can enter into a deep prayer and experience in any visit here. The Cathedral Basilica of Saint Louis is the second building to bear the title having been built to replace the old Cathedral in Saint Louis at the start of the 20th century. This work of art has become the heart of the Archdiocese of Saint Louis as it sits fairly near to the center of its titular city. This Cathedral Basilica is quite possibly the most beautiful piece of architecture and collection of artwork that you will find anywhere in the United States. From the dome that sits above the center aisle to the art adorning the walls, your life will be changed for the better if you make a pilgrimage here. I have been lost for hours at a time when visiting this church as the deep call to pray at each of the shrines continuously draw me in. The second you look up, you endanger your neck as it is likely that you will keep on looking up for the rest of your time there. 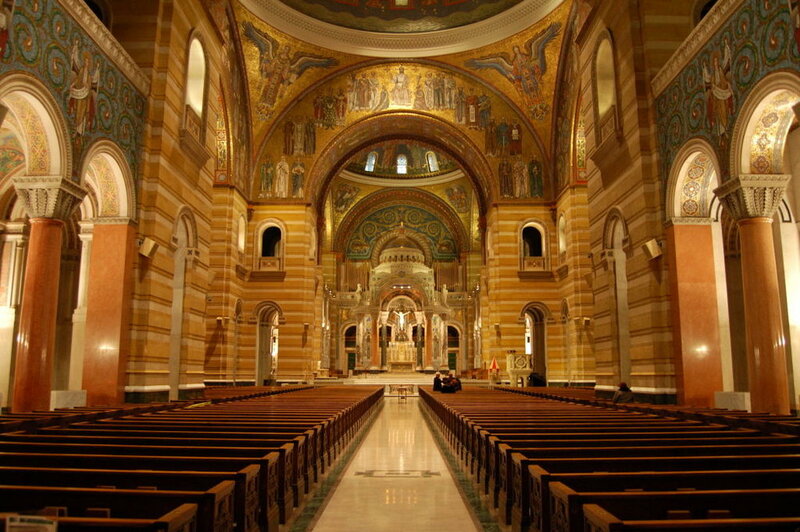 This pilgrimage site is the perfect place for an hour or an entire day and being in the heart of Saint Louis means that you are a short drive from the Arch, The Loop, and every other famous site in the city! Just 35 minutes down Interstate 80 from Omaha sits the Shrine of the Holy Family. The second you step foot into the Shrine, you find yourself taken away from the rest of the world. It is as if you are transported to somewhere outside of the business and the noise that surrounds us constantly. There is a visitors center that helps to explain the purpose and intent behind the Shrine but the chapel at the heart of it all truly speaks for itself. You can sense the connection with nature as along the sides of both sets of pew run streams of water. The window at the front of the chapel opens up to the open prairie as it hosts a beautiful image of the Holy Family. This view almost creates a serene vision of the Holy Family’s return from Egypt to Israel. It is here that pilgrims can encounter the Holy Family while on their own pilgrimage and be inspired by their example to be holy and humble in all things. The National Shrine of Our Lady of the Miraculous Medal was built in 1929 by the Promoters of the Association of the Miraculous Medal. However, many of the grounds date back to World War I or even earlier! The Grotto was built by seminarians during the late 1910’s and the Church was founded back in 1818 by the Vincentians. This Shrine upholds the devotions to Mary that its founders held as the continuous upkeep by those who run it now show their dedication to keeping the beauty of the Shrine. While there, I strongly encourage you to spend time set aside at each little part of the grounds in prayer. If you want to make this a full pilgrimage, I would encourage you to offer a rosary at the different Marian spots on the campus. And if you only want to pray one rosary during the visit, or even just a decade of one, I strongly encourage you to take time in prayer in the Church where the aspects of the altar take on the different images and words on the Miraculous Medal. Unfortunately, due to renovations, the Shrine will be closed until May 18th. But once it is reopened, I strongly encourage you to visit this Shrine! In Atchison, Kansas, just across the border from Missouri, sits a Benedictine Abbey founded in 1857. Sitting next to it is their university that they helped to found, Benedictine College. The monks themselves invite everyone to join them for prayer throughout the day (their schedule can be found on the website) and if you have never prayed with Benedictines, you really should make sure that you take the time to do so. There is no music more beautiful than when the Benedictines begin to sing the psalms and it moves the heart more than any reading ever could. The college itself is also rather beautiful and a great place filled with a serene spirit that you will feel as soon as you step foot on the campus. One of the most beautiful places on the campus is their Marian grotto and it is a must see during your visit! So take some time to visit the Benedictines and allow yourself to be drawn into their life of prayer!